Economics drive tar sands operations. Record highs in oil prices, though still fluctuating, will make tar sand oil ‘economical’ (read: profitable) well into the future. Government subsidies to this environmentally disastrous process remain in place from a time when the federal government was sponsoring research into the possibility of recovering this oil. Stock prices of tar sands developers grow the more conventional oil is scarce. New pipelines mean around 30 times more tar sands oil is likely to make its way to Europe than previously thought unless the European Union revives rules that would limit its use, figures showed on Friday. The data from the Natural Resources Defense Council (NRDC), a US environmental group, follows the publication of revised EU energy and environment policy for the next decade that drops specific goals on cutting the emissions of transport fuel. On the day following his Honor the Treaties concert at Massey Hall, where he had lambasted the Canadian government’s handling of Alberta’s oil-sands development, Neil Young continued his campaign against the environmental policies of Prime Minister Stephen Harper’s administration. How Is Climate Change Reshaping Our Culture? Tell us what you think. Then hear leading thinkers on shifts in tech, business, politics and nature at free Jan. 22 event. To resist the construction of the KXL and the expansion of tar sands infrastructure and dedicated to stopping Tar Sands transportation and extraction infrastructure in the beautiful heartland of North America. If anyone is surprised or disheartened by today's announcement about Gateway, you haven't been paying attention. This government is the most rancidly reactionary, anti-democratic and pro-industry ever seen in Canada. That is not to let anyone else off the hook for their crimes, either. It means you forgot the basic fact of how this works: They cannot be negotiated with. They must be stopped. Imperial Oil has announced it will not go ahead with the Mackenzie Gas Project, as the market conditions are just not good right now, says a company spokesman. 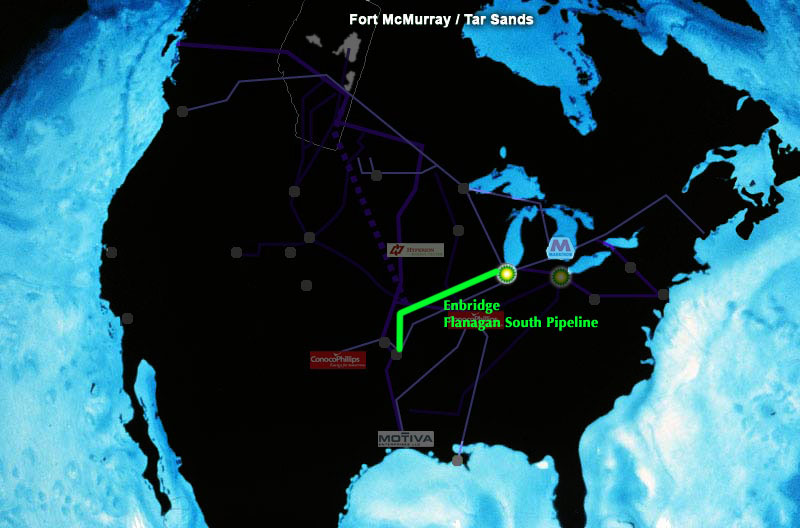 Imperial Oil had to give its decision on the construction of the pipeline to the National Energy Board by the end of 2013. The company was also required to provide an updated cost estimate. Enbridge Energy Company Inc. of Calgary and Edmonton, Alberta, work on the Flanagan South Pipeline Project has advanced in Lafayette County over the recent weeks. Pipeline trenches, welding and laying of pipeline work has increased. Driving to the west or north of Concordia will find its pathway. Clouds of coal dust and petroleum coke, a waste product from the refining of tar-sands oil, have been enveloping neighborhoods on Chicago’s southeast side. Federal, state, and city officials are finally moving to temper the dangerous air pollution. The villains: KCBX Terminals (a division of Koch Industries) and Beemsterboer Slag Co.